Bracelet wins Darley Stallions Irish Oaks for the Ballydoyle team - Well done to Ana O'Brien who finished 4th in her first classic. Bracelet gave trainer Aidan O'Brien a fourth victory in the Darley Irish Oaks at the Curragh with a determined effort in the hands of Colm O'Donoghue. Despite winning the Ribblesdale Stakes at Royal Ascot last month, Bracelet was a 10-1 shot stepped up to Group One level. Luca Cumani's British raider Volume took the field along for much of the mile and a half contest, but the pack had closed up by the home turn. Bracelet and stable companion Tapestry came to make it a three-way fight inside the final furlong and it was Bracelet who got the better of her stable companion by a neck to lead home an O'Brien a one-two. Volume was third. There was controversy before the off with Volume, third in the Oaks at Epsom, having to be replated after being found to be wearing shoes on her hind legs that are not allowed to be used in Ireland. The incident caused a long delay, with the race eventually getting under way around 20 minutes later than scheduled. For much of the journey it appeared Volume having not been in the parade ring for as long as her opponents could be a crucial factor as she bowled along clear of the field. Even when caught she did not go down without a fight, but she eventually had to make do with minor honours. O'Brien also saddled the fourth home Beyond Brilliance, ridden by his daughter Ana O'Brien, who was becoming the first female in history to ride in the race. The disappointment was Dermot Weld's 7-4 favourite Tarfasha, who had filled the runner-up spot ahead of Volume at Epsom. She moved into contention early in the straight, but was a spent force inside the final furlong and passed the post well beaten in fifth. O'Brien said: "I'm delighted for everyone. It's great for Colm. He's just got beat in this race a few times and he's also been beat in the Derby a few times. He gave her a marvellous ride and he's a world-class rider. "She ran a great race in Ascot. 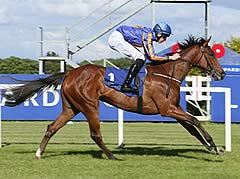 I knew Joseph (O'Brien) was going to ride Tapestry if the ground was good and he was true to his word. "Tapestry ran a great race, but she got a bit upset beforehand and circumstances conspired against her. "This filly (Bracelet) has an incredible pedigree by Montjeu. "Marvellous probably needs a little bit of ease in the ground and a bit of a rest now. "We knew Dermot and Luca's fillies were the ones everyone had to beat. They were the two form horses and we knew Luca's filly would probably make the running, so the race worked out well for us. "Beyond Brilliance did the same in Killarney. We weren't sure if she would get the trip, but Ana said she would and it was a great run. "It's a very important race for us. It's seriously important for the fillies. "We're in a privileged position we have such good fillies to run in the race." O'Donoghue, securing his first Irish Classic victory following several near-misses, said: "She came into the race with a very good profile having won the Ribblesdale. They went a hard pace throughout and she ground it out well. "She's quite calm at home. She came here on top of her form. She's bred to win the race and she's done it." Cumani said: "As far as I'm concerned it wasn't a controversy because it's never been one in England. "For horses that can knock themselves behind, we have what are called trailers on their hind shoes which helps them keep their hind feet apart and stops them knocking their hind legs. "We've done this in England many times, we've done it round the world many times and it never entered our calculations that it may not be allowed here. "As it wasn't allowed, fine. Rules are rules. We took those off and she ran well. "It took a bit of time and I apologise for the delay we caused, but in all honesty we just didn't know this would be a problem. "I'm here to get the filly to the post and make sure she runs to the best of her ability. "Those shoes have helped her in the past, so we just did what was best for the filly. "I'm sure the public were happy to see her run and not have her withdrawn. "I got a little bit hopeful about a furlong out, but two fillies quickened up past her. She was trying to come back at the end, so all credit to her. "I think the Yorkshire Oaks will come into the reckoning now."